Abstract: In the past ten years flexible pipe has been increasingly utilised in floating production and marginal field developments, especially to accommodate dynamic motions and large pipeline misalignments. 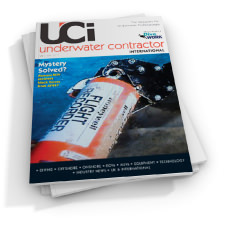 The pipeline industry has begun to recognise the importance of this new technology and should therefore apply a better engineered approach towards assessing ultimate performance capability. Due to the fact that flexible pipe is made from a composite, nonhomogeneous material construction, new developments with regard to inspection methodology and monitoring techniques are required in order to obtain meaningful data about the presence and significance of defects in the pipe, and relate these to overall integrity. This paper outlines the prerequisites for the formulation of an inspection programme, and highlights progress in the development of state–of–the–art NDT methods. Abstract: In the south–east of England, 25% of the demand for raw materials for the construction industry is met from marine dredged sand and gravel. Future supplies of marine dredged aggregates will depend on the identification of resources and the licensing of reserves of marine sand and gravel. Whereas a significant database exists on the extent of land resources of sand and gravel, information on the distribution, qualify and quantity of marine aggregate resources is sparse. In recognition of the importance of marine aggregate supplies, the Crown Estate and the Department of the Environment have recently commissioned the BGS to undertake a programme of research designed to investigate offshore resources of sand and gravel. In 1986 a desk study was undertaken to assess existing information relevant to marine aggregate resources in the southern North Sea. Subsequently, an area off East Anglia was surveyed using geophysical techniques calibrated, in 1987, by sampling and coring. The work has established the stratigraphy and lithology of the Holocene and underlying Pleistocene sediments and the distribution and potential quality of sand and gravel resources. The determination of marine aggregate resource potential is demonstrably dependent on the development of an understanding of the regional geology of an area. the purpose of this paper is to demonstrate the importance of geological studies in marine aggregate evaluation and to show how an understanding of the regional geology is fundamental to the efficient management and extraction of offshore sand and gravel deposits. Abstract: The welcome announcement on 5 March 1990 by UK Minister for the Environment that shallow sea disposal of industrial wastes and sewage sludge is to cease by 1998, and similar disposal of raw sewage at some future date, starts the race to find acceptable alternatives. These alternatives will have to be both economically affordable and environmentally friendly. All the options presently adopted in the UK and on mainland Europe carry environmental penalties; the technologies needed for effective recycling are yet to be developed. Deed oceans of abyssal depths 3000–6000m cover half the Earth’s surface; they are yet to be utilised by Man. The increasing pressure on terrestrial resources created by population growth and industrialisation will soon force us to utilise the oceans more. Disposal of large–bulk low–toxicity wastes direct onto the sea–bed at abyssal depths offers an option which promises to be environmentally safe and relatively inexpensive. The acceptability of adopting such procedures is discussed and some criteria of acceptability suggested. Existing knowledge of the deep ocean is sufficient to suggest that a pilot scheme could be started without risk. However, monitoring would be necessary to ensure the method continues to comply with the criteria suggested. Techniques for monitoring abyssal depths are now available. Abstract: This paper outlines research conducted into the development of a novel form of acoustic beamforming. The principles of operation of the system are discussed and some future applications suggested. 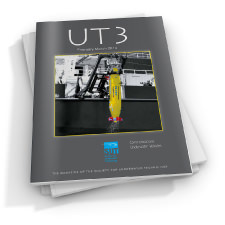 Abstract: A field proven seafloor system has been developed at UCNW, Bangor, enabling in situ geophysical measurements of bottom sediments to be taken. The system comprises a seafloor sledge, on which are mounted two seismic sources and an electrical resistivity pad. Attached to the rear of the sledge are six, equispaced, two–component, gimbal–mounted seismometers. Ship deployment techniques have proved very important and these have been modified to maximise survey efficiency. Results yielded include shear wave velocity, compressional wave velocity and apparent formation factor. Given these data, it is possible to infer sediment dynamic elastic moduli and porosity values of the in situ seafloor material. The commercial viability of this system is that it will enable the user to map out the spatial distribution of these parameters over a given site relatively quickly and economically. Abstract: The recruitment and training of skilled manpower will represent a serious challenge to the marine and offshore industry in the 1990s. Even if companies can recruit the type and numbers of skilled people they want, will they be able to keep them? Abstract: Saga Petroleum a.s. will utilize both tension leg platform and subsea production technologies for phased development of the Snorre field. This paper describes the control system for the Snorre subsea production system. General system requirements and equipment configuration of the subsea control system are presented, along with the current work status and an outline of future testing and installation activities. Abstract: The advantages of using hydrogen as a breathing gas constituent, namely low breathing resistance, anti–HPNS effect when mixed in suitable proportions with helium, availability and low cost are discussed. The high flammability of hydrogen, its major disadvantage, is addressed in some detail and intrinsic safety curves for H2/air and H2/02 are presented, though the point is made that H2/air mixtures suitable for breathing at depths beyond, certainly, 200m are non–flammable because of the small percentage of oxygen present. Other relatively minor disadvantages of hydrogen, namely greater respiratory heat loss and speech distortion compared with helium, are also considered and it is shown that the same problems exist with hydrogen as for helium but to a greater degree, calling for more precise control of breathing gas temperature and more exacting requirements for the design of communication system. It is concluded that an intrinsically safe electrical system can be designed for communication and sensor applications for use in H2/02 mixtures, and that for many applications, optics technology offers a safe and viable alternative to electricity. 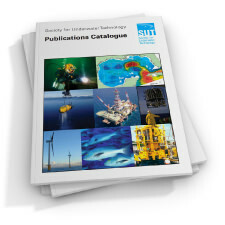 Abstract: Downhole measurements provide a continuous record of sub–seabed characteristics and phenomena at in situ conditions. The operating limits of most commercial facilities are around 170–200°C, with some tools being rated up to 260°C. For high–temperature environments, quantified as 350–400°C, there are no commercial measurement facilities and only a few specialised tools exist. In order to redress this situation, and thereby to prepare to meet the scientific challenges of the ‘nineties, initiatives are underway to develop operational high–temperature logging tools. The magnitude and nature of this task are reviewed and realistic targets identified for the future availability of technology. Important issues concern the relationship of these targets to drilling and coring practices: it is not feasible to develop a scenario for downhole measurements in isolation from the practicalities of borehole conditions and calibration needs. In the past, scientific drilling programmes have largely relied upon oil industry technology for their downhole measurement capabilities. This relationship is now changing. During the ‘nineties it is expected that scientific drilling projects will provide the impetus for technological developments and advances in the ‘state of the art’ of borehole sensing. Abstract: The ROHP is a multipurpose underwater inspection system developed by Rijkswaterstaat North Sea Directorate and Seatec Underwater Systems in the Netherlands The ROHP is specially designed for the Southern North Sea and other areas with severe underwater conditions, namely high current velocities and bad visibility. The advanced techniques and controls allow the vehicle to operate as a very unique inspection and work platform. Due to the big pay–load, an unlimited variety of tools and sensors can be fitted to execute any tasks within the capabilities of the system. Built to the high demands of the working areas and their hostile environments, the ROHP system with its outstanding capabilities offers an attractive alternative to existing underwater systems. Abstract: Substances are transported through the oceans by a wide range of biological, chemical and physical processes. Their mode and rate of transport, as well as their ultimate fate, is largely controlled by their partitioning between particulate and dissolved phases. Such transport mechanisms are presently not well understood. Studies of oceanic particles are generally limited by their low concentrations, necessitating the development of specialised instrumentation to enable their collection and observation whilst maintaining their integrity. In this article, state–of–the–art instrumental methods are briefly reviewed, focusing on the principles, advantages, disadvantages and problems of each technique from a technological viewpoint; present studies in the N.E. Atlantic, as part of the Biogeochemical Ocean Flux Study, are discussed. Abstract: The shear modulus (G) of a soil is a measure of its stiffness and is therefore a key soil parameter in many different geotechnical engineering applications where foundation soil–structure interaction is important. The seismic cone is a new in situ device for the measurement of the low strain shear modulus, developed by Fugro–McClelland as an offshore site investigation technique that overcomes some of the disadvantages of site accessibility and deployment of cross–hole seismic testing, combining traditional cone penetrometer testing with geophysical property measurement in one tool. A brief description of the development history of the seismic piezocone testing system is given. The different modes of operation in offshore site investigations are outlined. Laboratory tests which measure the shear modulus are the conventional low strain resonant column test and the piezoceramic bender element test as recently improved by the Norwegian Geotechnical Institute. A brief description of these tests and the test conditions are given. Results from the seismic cone, resonant column and piezoceramic bender element tests for a number of Norwegian North Sea sites in Quaternary soils are presented and the derived soil stiffnesses are compared. It is concluded that the seismic cone test, when used in conjunction with resonant column and piezoceramic bender element tests, is a valuable new tool for accurate in situ seismic shear modulus testing in offshore site investigations. Current research is focused on the integration of the in situ measurements into high resolution seismic surveys to enable quantitative analysis of the latter into geotechnical parameters. Abstract: The Brae field, discovered in 1975, is located in block 16/7 about 42 nautical miles north west of the Occidental Piper field and 70 nautical miles north of the BP Forties field. The Brae ‘A’ platform was installed in 1982. First oil was exported in July 1983 and production rates of around 100,000 barrels per day have been achieved. The Brae ‘B’ platform was installed in 1987 and first oil was achieved in April 1988. The Brae ‘A’ and Brae ‘B’ platforms are connected to each other by a twin 18″ pipeline system. From the Brae ‘B’ platform, oil is transported to Brae ‘A’ where it is combined with the processed Brae ‘A’ oil. The combined oil is then transported via the 30″ submarine pipeline to BP’s Forties Charlie platform where it enters into BP’s 32″ submarine pipeline for transportation to the processing facility at Kinneil. The Central Brae project is Marathon’s first sub sea development and has been managed by a dedicated team of engineers and support staff drawn from their respective discipline departments. The Central Brae project is Marathon’s first sub sea development and has been managed by a dedicated team of engineers and support staff drawn from their respective discipline departments. A major part of the project comprises the 6″ production, 4″ service, and 10″ water injection pipelines, the retrofit caisson riser and the chemical and control umbilicals. Together these represent over a third of the total development cost. The development plan for Central Brae wa approved by the Brae group participants in October 1987, and Department of Energy approval was received in 1988. This paper presents a general description of the project together with a more detailed account of the design, fabrication and installation of the retrofit caisson bundled rise system. Abstract: Because of favourable geographic location and other reasons relating to energy utilization characteristics and technology development, the R.O.C. Energy Commission conceived and promoted a ‘multiple product Ocean Thermal Energy Conversion (OTEC)’ project in 1988 and prepared a development plan for this project in 1989. The development plan outlined the steps necessary for the commercialization of OTEC plants in Taiwan. Designing, building and testing of a 5MWe (net) pilot plant and an associated mariculture facility are the major elements proposed in the development plan. This paper presents the scope and major objectives of the project, and describes the essential elements and tasks proposed in the development plan. Baseline design, technical considerations, management plan, project schedule and follow up development are also discussed. Abstract: A concept exploration model is an automated approach to producing balanced vehicle solutions. 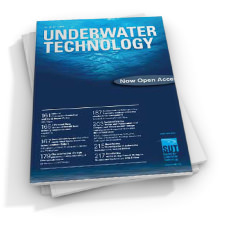 This paper describes the structure of such a computer model designed for the synthesis of simple Autonomous Underwater Vehicles. The required input data and the options available with the program are described . The techniques employed to calculate the weights and volumes of all the component subsystems are outlined and the means of ensuring design balance is explained. Sample program output is provided, together with typical results which illustrate the ability of the model to quantify the effects of altered design requirements on vehicle characteristics. Abstract: Environmental forces are discussed in connection with the overall problem of the design of new, or the assessment of existing, structures. It is essential to see environmental forces in this broader context and to integrate them with all the other aspects involved. ‘Structures’ refers here in general to all types and applications − floating and bottom supported, compliant and fixed. Where a discussion is aimed at a particular group, this is specifically identified, such as in the case of fixed space frame structures, to which special attention is paid. Offshore structures engineering has in many respects become a mature discipline. However, further developments are still necessary to fully benefit from the large increase in knowledge after so many years of research and development efforts, as well as from the accumulated experience with real platforms offshore. This is in the best interest of safety, the extended use of existing structures and the more economical design of new ones. The next major step is sometimes suggested to be structural reliability analysis, which would require both the loading and the structural models (describing generally elastic as well as rigid body properties) to become probabilistic. In general this is not yet considered to be within reach and is cautioned against. However, the underlying principle is warmly supported and the introduction of concepts which are firmly based on reliability analysis methods is a realistic goal to aim for. It is suggested that significant progress in this direction can be made by using loading models which incorporate the probabilistic features which reflect the random waive environment in a realistic manner, in combination with (nearly) deterministic structural models. Where such loading models are not already current practice, they should be introduced forthwith. This demands a truthful representation of random wave kinematics and realistic force coefficients, including the drag and inertia coefficients in Morison’s equation for fixed structures. A perceived way forward is described and proposals are made on how to achieve this. Abstract: Studies on polymetallic manganese nodules in some South Pacific EEZs show that nickel (Ni) and copper (Cu) reach their greatest combined abundances of over 2% between 2−8°S. Cobalt (Co) reaches its greatest abundance of 0.6% south of 8°S. Nodule abundances are greatest in the Co–rich are giving highest metal quantities per sq metre there, particularly of Co. In Co–rich crusts, Co averages about 0.7%. Much greater quantifies of valuable metals in the nodules than in the crusts suggest that the nodules represent a greater future metal resource than the crusts in the EEZs studied, even for Co. Polymetallic sulphides consist of sulphides of iron (Fe), copper (Cu) and zinc (Zn) formed by hydrothermal processes, and occur in the EEZs of Fiji, Tonga and Papua New Guinea. Related deposits occur in the EEZ of Pitcairn Island. Enrichments of gold and silver are common in the deposits. 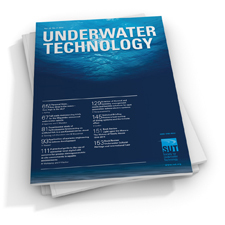 Abstract: Advances in instrumentation and computer technology now make it possible to measure the acoustic properties of marine sediments in situ and in real time. It is thus timely to reassess both the state of our knowledge of the physical properties of these sediments and the possibility of using seismic measurements to routinely estimate porosity, permeability, etc. In this paper the statistical relationship between compressional velocity and porosity published by Akal is critically discussed. Experimental data relating acoustic attenuation to grain size are presented for unconsolidated sediments and compared with data for sedimentary rocks. It is demonstrated that there is no extant theory which can account for these experimental data.